The Ottawa 67’s unofficial start to their 50th Anniversary Season is just days away with training camp set to open on Wednesday. On Friday, the hockey club announced a pair of key signings – Andy Chiodo as the Goaltending Coach and Derek Miller as Director of Player Development and Performance. Chiodo, who has played in nine leagues over the course of his career including the NHL, comes to the nation’s capital fresh off his 14th season as a pro playing the 2016-17 campaign in Austria with HC Innsbruck. His journey to professional hockey went through the OHL spending three seasons with the Toronto St. Michael’s Majors before being drafted into the NHL and featuring for the Pittsburgh Penguins. In addition to his NHL experience with the Penguins, Chiodo’s career has included stops in the AHL with the Penguins affiliate Wilkes-Barre/Scranton as well as the Binghamton Senators, a year in the KHL with Dynamo Minsk in addition to stops in the ECHL, SM-Liiga (Finland) and Austrian League. Miller, who moved to Ottawa in 2008, brings a wealth of hockey development and coaching experience to the 67’s. He has served as the Development Director of Scottish Ice Hockey and was also the U17 and U19 coach of the Scottish National Team. Locally, Miller has served as the Head Hockey Instructor for Ottawa Senators Hockey Programs and an assistant coach with the Carleton University Ravens Women’s team. He has also served as Owner and Operator of Miller Hockey Consulting and Owner and Director of Next Generation HKY. While still in the NCAA and pro-hockey ranks, Miller spent his off-seasons as the head hockey instructor with one of the world’s largest hockey schools – Planet Hockey where he would also become the Director of Canadian Programs. Miller spent four seasons in the NCAA with the University of Wisconsin reaching the National Championships in 2006 while serving as team captain. He would play professionally in AHL, CHL and UHL and also competed for two years in the Red Bull Crashed Ice circuit. 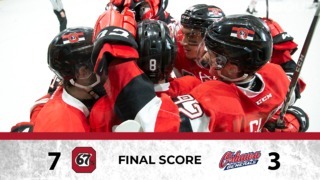 The 67’s open training camp on August 30 at the University of Ottawa Minto Complex. Red -vs- White games on August 30 (7-9pm) and August 31 (11am-1pm; 5-7pm) take place at uOttawa and are open to the public. The Barber Poles will face the Kingston Frontenacs twice in pre-season action. They will travel to Kingston on September 3 to battle at the K-Rock Centre at 2:00 p.m. 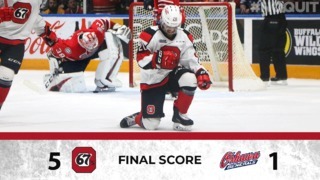 The 67’s announced Tuesday that their second pre-season game, September 15 vs Kingston, will be hosted at the CIH Arena in Rockland at 7:00 p.m. Score your seats for that game by clicking here. 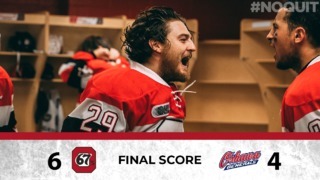 The 67’s open their 50th Anniversary Season on September 21 in Barrie, with their home opener set for Sunday, September 24 against the reigning OHL Champions, the Erie Otters. There will be seven signature games celebrating the 50 years of history that fans can experience by purchasing the Celebration Pack starting at $99 (Click Here). Season tickets for the 67’s 50th Anniversary Season are on sale now by clicking here, calling 613.232.6767 X1 Option 2, or in person at The Box Office at TD Place. Season Ticket Packages start as low as $325 – less than $10 per game.